Ellisville real estate is made up of both new construction homes and more established subdivisions. These single family homes offer floor plans with 2 bedroom, 3 bedroom or 4 bedroom options. Ellisville MO homes for sale range in price from about $100,00 to about $700,000. The median home price in 2014 was approximately $250,000. Residents of Ellisville enjoy eight treed and well maintained parks. Bluebird Park is located on 167 acres and provides an aquatic center, playground, 3 tennis courts, 3 pavilions, 2 softball fields, dog park, a challenging 9 hole disc golf course, amphitheater, and trail. The EDGE aquatic center provides an 8 lane competition/lap pool, children’s splash pool, an infinity edge waterfall and a waterslide. Buyers with children that are considering a home in Ellisville will be excited to learn that it is served by sought after Rockwood School District. Among numerous other awards all four of the high schools were named “most Challenging” by the Washington Post, a list of their numerous achievements can be found on their Awards Page. Great Schools for up to date ranking on every school in the area. If you are looking for a homes for sale in Ellisville MO or you would be interested in buying a home in Ellisville , please contact St Louis County real estate expert, Sharon Colona and St. Louis Realty for a professional and simple buying or selling process. Call (636) 397-7653 or email at scolona@stlouisrealty.net. Currently zoned residential, but could easily be re-zoned commercial. Wonderful, high traffic location between Clayton and Manchester surrounded by restaurants, offices and retailers....Great visibility, the business possibilities are unlimited. Home to be sold as is seller to do no repairs or inspections. OPEN SAT 4/20 1-3pm. Stunning 6 Bd/4.5 Bth home w/5600+ sqft living space w/LL, offers 2 Master Suites, all on a gorgeous lot in Polo Lake! Main Flr boasts stunning wood floors throughout formal Dining Rm, Office & Great Rm w/fantastic wall of windows & gas FP w/built-ins. Gorgeous Kitchen includes butterfly island, granite, glass cooktop, SS appliances, walk-in pantry, desk & Breakfast Rm! Convenient Laundry Rm & Powder Rm! Main Flr Master Ste w/large walk-in closet & Bth w/dual sinks, jetted tub, garden window & frameless shower. Upstairs finds 2nd Master Ste w/2 walk-in closets, dual sinks, jetted tub & frameless shower - attached room could be Nursery, or 4th Bd! 2 Bds & add x2019;l full Bth completes upstairs! W/O LL includes huge Family Rm, Rec Rm w/wet bar, 2nd FP, 6th Bd & full Bth. Perfect home for entertaining! Sit outside & enjoy the newly stained, spacious deck overlooking the park like yard! Just steps from Bluebird Park & convenient to shops & restaurants. Rockwood Schools! Awesome 1.5 story located on a cul-de-sac lot with a fenced yard. Enter to find the dining room with elegant columns, coffered ceiling and opens to the great room with custom windows. Gorgeous kitchen boasts 42 cabinets, center island, custom backsplash, double ovens, walk-in pantry and adjoins the breakfast room with slider to the back patio. Cozy hearth room with gas fireplace. Master suite features coffered ceiling, walk-in closet with organizers and a full bath with his & her vanities, walk-in shower, and large tub. Upper level has 3 additional bedrooms, 2 full baths, office/sitting room, and bonus room. Lower level is ready to be finished to your liking with a full window for a bedroom and rough-in bath. Main level laundry with additional hook-up in the lower level, sprinkler system, 3 car garage, Rockwood Schools and much more! Step in and discover one of Ellisville x2019;s best hidden secrets! This nearly new former DISPLAY with MANY upgrades surely won x2019;t disappoint. This open floorplan, 3 Bedroom 3 Bathroom Ranch villa is low maintenance that offers the ultimate carefree lifestyle. Entry foyer greets you with a vaulted ceiling and stunning Handscraped Wood Flooring that flows throughout most of the main level. Great Room features Vaulted Ceiling, Gas Fireplace, recessed lighting w/ lighted ceiling fan. Gourmet Kitchen has SS appliances, large center island with granite tops, pendant lighting, pantry with frosted glass door, gas cooktop and double ovens. Enjoy your morning coffee on the 9x12 Composite Deck. Master Bedroom Suite also features Vaulted Ceiling with double closets, adult height vanities w/ double sinks &oversized shower. Finished LL features rec room with recessed lighting, 3rd bedroom and full bathroom. Rockwood Schools. Close to shopping, dining & major HWYs. Only thing missing is YOU! Immaculate 2-year NEW villa on premium lot probably the best in the subdivision. Warm solid wood floors welcome you to the open floor plan w/vaulted ceilings in family room, kitchen & master bedroom. Gourmet kitchen w/granite countertops, large kitchen island, 42-inch cabinets, SS high end appliances, pantry with glass door and large dining area perfect for family gatherings. Expansive master bedroom offers lots of natural light from the large bay window, large double closets lead to the master bath w/double sinks, walk in shower w/seat & linen closet. 2nd bedroom, full bath & laundry room complete main level. The open stairwell with iron balusters and lighted steps leads you to the spacious lower level with recreation room, 3rd bedroom and full bath. Additional upgrades include: 6 ft windows, tall baseboards, canned lighting, wrap applied to unfinished basement, upgraded carpet, security system, low maintenance deck, drywalled garage and so much more! GET READY TO BE IMPRESSED! Professional Landscaping, irresistible curb appeal w/ top quality renovation deliver 2000+ sq ft quality, class and amazing level of livability. House had gone through a total makeover within the recent years. Inviting open floor plan, gleaming hardwood floor, dramatic stacked stone fireplace, newer windows and deck, there is no details missed. Gourmet kitchen offers new cabinets w/ crown molding, granite counter top, backslash, stainless steel appliances, center islands w/ extended breakfast bar! Romantic master suite offers updated shower, double vanity, walk-in closets w/ organizer. Three additional bdrms and the hall bath complete the second floor. Spacious walkout basement offers lots of storage and natural light. Newer roof, hot water heater, newer HVAC, gorgeous deck on bigger lot highlight beautiful outdoor living. Low maintenance exterior, AAA schools, convenient location to shopping, restaurant. This home has everything you have been looking for! New Home in a Hurry! Awesome Open Floor plan w/ Vaulted Ceilings in Kitchen, Breakfast Room and Family Room. Optional Gourmet Kitchen Plan, Stainless Steel GE Kitchen Appliances with Double Oven and Gas Cooktop, Level 3 Aristokraft Cabinets Throughout home, 42 Tall Kitchen Wall Cabinets, Bay Windows in Master Bedroom, Adult Height Vanity with Double Sinks in Master Bathroom, 5ft Walk In Shower with Marble Seat in Master Bath, Upgraded Flooring and Lighting, White Two Panel Doors with Venetian Bronze Hardware, Open Spindled Railing at Basement Stairs, Various Recessed Can Lighting, 3/4 Bath Rough In Basement. Amber Trails features McBride x2019;s low-maintenance award winning floor plans. Photo images are of display Home. Optional features may be shown. Consult with on-site builder sales for included features. Beautiful, meticulously maintained, move in ready ranch w/2600+ sf of living space. Almost a half-acre in a serene wooded setting looking out to adjoining Bluebird Park, enjoy the privacy from your 450-sf deck (18), great for morning coffee or entertaining. Fenced yard on quiet cul-de-sac in Rockwood Schools. Great open floor plan with entry foyer, dining room, charming kitchen and cozy living room w/gas fireplace. Large master suite with French door that leads to the deck, walk-in closet, bath w/jacuzzi tub & separate shower. Second bed w/large closet and another full bath. Spacious, light filled walk-out LL w/family room, wood burning fireplace, bay window and slider door to patio (18), 3rd bed w/walk-in closet, full bath, small bonus room/office, large laundry w/cabinets, sink and cedar closet. Additional features include brick on 3 sides, wood floors, attic fan, newer roof (15), 3-ton A/C (18), tons of natural light throughout and so much more! Sound home with a must-see view. Extensively updated walk out ranch with 3 sides brick and vinyl exterior, soffits, concrete driveway, newer architectural roof, crown molding in living and dining rooms, newer light fixtures, electric panels, recessed lighting and fans, newer Maple cabinets in the kitchen with crown molding, stainless appliances including a gas range, breakfast bar and breakfast room with slider to deck. Master bedroom with organized closet, updated master bath, family room with recessed lighting, brick to ceiling gas starter wood burning fireplace, newer wood floor, finished stairs to large basement ready to be finished, newer furnace and a/c, newer 50 gallon hot water heater, energy efficient sliding doors to newer concrete patio & deck, nicely landscaped yard, 3 bedrooms, 2 baths, 2 car garage with garage door opener. All of this in Ellisville on a quiet cul-de-sac lot in the Rockwood School District. Just move in and enjoy the home and nearby Bluebird Park pool, walking trails. No subdivision fee! Great West County location! Almost 1600 sqft in this spacious move-in ready ranch with open floor plan. Easy access to shopping, restaurants, highways and the many parks in the Ellisville/Wildwood area. This home has been completely remodeled and sure to impress! Hardwood floors welcome you home and continue throughout the main living areas and bedrooms. New roof with architectural shingles, new gutters, all new insulated windows including an oversized bay window, new sliding door leading to patio, new heating system, new garage door and opener, new flooring in kitchen and breakfast room. Gorgeous kitchen with pantry, tiled backsplash, solid surface counters, all new stainless steel appliances, as well as a stunning center island featuring a Quartz countertop. The master suite features a walk in closet and updated bathroom including a floor to ceiling tiled shower. This property features brick and newer Hardy Plank siding. The expansive fenced in backyard is perfect for entertaining. Great opportunity!!!! Great Floor plan and Curb appeal. 2 similar ranch homes sold last year same subdivision for $270,000 xD; xA; This is a special offering. Seller multiple offer policy Seller reserves the right to accept any offer regardless of the order received. All offers should be written on a special sales Contract. This house needs some cosmetic updates but all systems appear to be functional. Tastefully updated ranch home in Tara Heights! Open floor plan includes spacious living room with oak flooring & wide bay window and bright open kitchen with quality appliances, breakfast bar & 1/2-glass door that walks out to deck. A large master bedroom plus 2 additional bedrooms (all with hardwood flooring!) & hall full bath complete the main floor living quarters. Finished Lower Level includes huge recreation room, office/sleeping area & full bath. Situated on a .49-ac lot with deep fenced backyard & large deck x2014;ideal for outdoor entertaining x2014;plus oversized 2-car garage. Conveniently located near shopping, restaurants & Bluebird Park--Ellisville Elementary is just a quick walk away. Award-winning Rockwood School district. Unique, one of a kind very updated and remodeled ranch home in move-in ready condition. Owner, an electrician by trade along with being a very talented craftsman and artist has created a very special home with many custom features. Over the past several years he transformed the interior and exterior by completely gutting walls, new flooring w. wood grained ceramic tile, all new light fixtures, some stainless steel appliances (unused oven and dishwasher). SS Refrigerator included, electric smooth glass cooktop and range hood. Bathroom remodel completed March 2019 plus some interior doors and new garage door opener. Photos do not capture the skill and imagination of the total feeling you enjoy when there. You MUST SEE to appreciate. Entertain on the wood deck with pizza oven, grill, sink, bench seating and large pergola with 5' wind-chimes singing in the breeze. Outdoor storage building houses lawn equipment, etc. Oversized 2 car gar w. overhead storage and utility/laundry room. Sparkling townhouse with open floor plan. Kitchen features matching black on black appliances with smooth top stove. Stainless steel side by side refrigerator. Elevated breakfast bar. Hardwood floors in kitchen, entry & breakfast bar area. Freshly painted interior and newer carpet. Second floor has master bedroom suite with walk-in closet. 2nd bedroom and bonus room/ office. Could be 3rd bedroom. Second floor laundry is a nice touch with oversized LG washer and dryer. Replacement windows. Attached garage with keypad entry and nice patio. Walk to Blue Bird Park. Fantastic location. Fantastic Location, Well Maintained Townhouse! Gleaming Hardwood Floors on main level, and newer carpet upstairs. You will love the flow of the Open Floor Plan, living room flows into Dining Room, Updated Kitchen, sliding glass doors that lead to your Private Patio. On the Upper level you have Two Spacious Bedrooms both with Walk-in Closets. Master Bedroom Suite, additional Full bath upstairs, and Large Loft Area Great for Office Space! Un-finished Basement is partially carpeted, Laundry Room, and plenty of storage space. The Townhome has a One Car Attached garage. All of this and in walking distance to Bluebird Park that offers endless entertainment: Edge Aquatic Center, Dog Park, Summer Concerts at the outdoor Amphitheatre, Tennis courts, Frisbee Golf, and so much more. 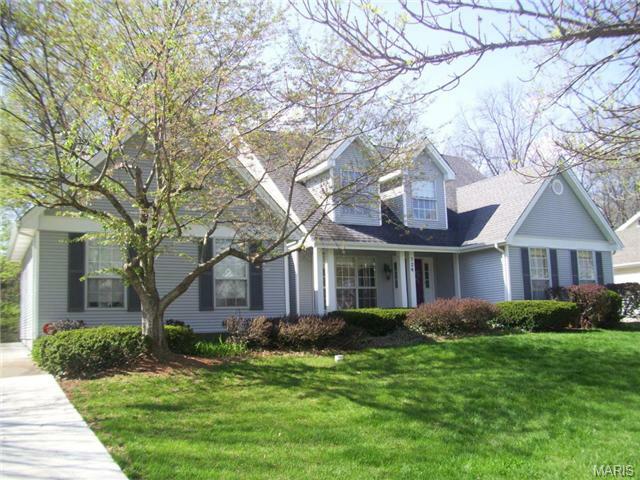 Located in Rockwood School District, endless shopping, and Restaurants. Don x2019;t miss this well appointed, Maintenance free Townhouse located in Ellisville. Call today and set up your private Tour!